Welcome back to our Valente Law page! Here at our Chicago law firm, Charles Valente and his whole team of legal experts are working endlessly for the clients who trust in what we do. We’ve helped countless Chicago area residents with their legal disputes and wealth management for over twenty years and we’re not slowing down any time soon. With the experience, the professionalism, and the pragmatic legal brilliance that we bring to every case, our clients receive the best legal advice and action that The Windy City has to offer. Are you needing help planning your estate, navigating your wealth management, settling a business dispute, or wading through a real estate dispute? Charles Valente at Valente Law would love to talk to you more about your case. Give our law offices a call at 312-832-7890 or reach out to us through our website. We’d love to hear from you and set up your first consultation. What is a Real Estate Dispute? Have you recently bought a house that hasn’t turned out to be everything that you hoped? Were you shocked to find out that the repairs that you had discussed with the seller were not taken care of as they were supposed to have been? Has one party backed out of a contract once they committed to it? Are you facing a zoning issue? If you answered yes to any of these questions, you may be on the brink of a real estate dispute. Real estate disputes can be a huge source of stress for so many individuals. You’re worried that you won’t get a favorable outcome, or you’re wondering about the best way to navigate your dispute. 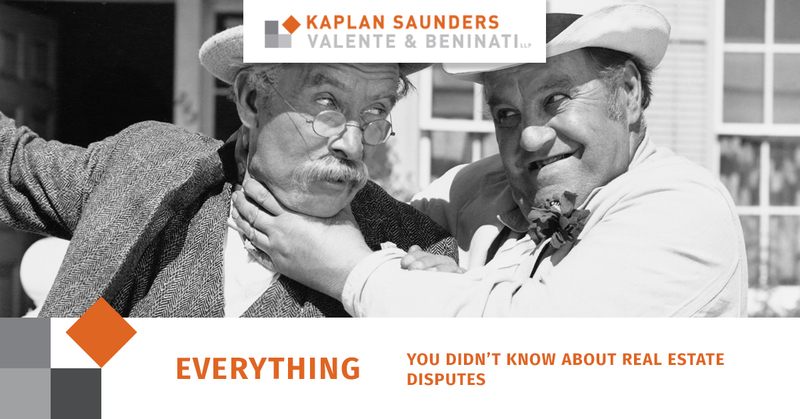 There are all kinds of reasons that you may be at the beginning, in the middle, or finding yourself at the tail end of an exhausting real estate dispute and in today’s blog, we’re going to explore them. Whether you’re a property owner, bank or lender, title insurer, commercial landlord, commercial tenant, or broker, you’ll want to make sure you understand the ins and outs of real estate disputes. Continue reading on to learn more about real estate disputes and how Valente Law can help you when you find yourself in the middle of one. No one wants to buy a house and later discover that there was a significant issue that remained undisclosed throughout the entire inspection and closing process. When you properly factor in severe plumbing problems, foundation issues, or wiring complications, the value of your new house may be significantly less than what you paid. If the seller was well aware of these frustrating issues before the house was sold and they remained silent throughout the whole process of transferring ownership, you may have found yourself in a situation that requires a lawsuit. If you’ve discovered problems that have clearly existed before the purchase of your new home and you’d like to talk to someone about making it right, contact the expert legal team at Valente Law now! Buying a new house here in Chicago can be an exhausting process, after countless meetings with realtors, mortgage brokers, and homeowners, you’ve finally come to a final closing day at which all of the home’s contractual T’s have been crossed and the I’s have been dotted. In many cases, the previous owner has a list of repairs to make before the sale of the house may proceed, and nine times out of ten, these repairs happen as they’re supposed to. But what happens when the repairs were sloppily done or not performed at all? If you’ve come across an issue like this, it might be time to contact Charles Valente at Valente Law. Anyone who has walked through purchasing a home knows what an exhausting and stressful the whole process can be. From the information needed to qualify for your home loan to “signing your life away,” when it’s finally closing day, home buying and selling can really take a lot out of a person. That being said, once you’ve signed contracts, neither party has a legal right to back out. Keep this in mind before you sign anything. If you’re the one left holding the pen after another party has backed out of a contract, you’ll definitely want to pursue legal action. Contact Valente Law today! When someone purchases a home and their intention is to use it as a business, zoo, or anything else besides a residential property, this could cause a fairly significant zoning issue. A number of real estate disputes are caused when there is a zoning dispute. If you’re interested in purchasing a residential Chicago property for commercial use or vise-versa, contact our legal team at Valente Law today. Don’t sign until you’ve spoken to us. In addition to the above-mentioned reasons for real estate disputes, we’re also well-accustomed to dealing with disputes and conflicts regarding foreclosures, fraud, quiet titles, receivership matters, landlord-tenant matters, shopping center disputes, mechanic’s liens, construction conflicts, and so much more. The Valente team has extensive experience in providing advice and counsel to clients on the efficient resolution of disputes. We consider some of our greatest successes to be those matters resolved through negotiation and not litigation. For all real estate disputes, reach out to Valente Law today! No matter the reason for your real estate dispute, we understand that it can feel like an overwhelming thing for you to handle. Don’t deal with your dispute on your own; reach out to our team of Chicago legal experts so that you don’t make any crucial or costly mistakes. When it comes to real estate disputes, you need a professional to help you ensure that you get the best outcome for yourself and your family. Valente Law firm has received a tier one ranking in real estate litigation from the US News and World Report for the last four years running and we’re not slowing down anytime soon. Do you need an excellent Chicago attorney? Charles Valente has almost three decades of experience in helping area locals with their legal issues and Valente Law has a whole two decades of experience doing what we do! Whether you’re in the middle of a business dispute, you’re needing a lawyer for your real estate dispute, you’d like legal counsel for planning your estate or handling your wealth management, contact one of the best legal minds in the city: Charles Valente. Our legal team would love to talk to you about your case and if we end up working together, we’ll do everything we can to help you get a favorable outcome. Reach out to Valente Law today!